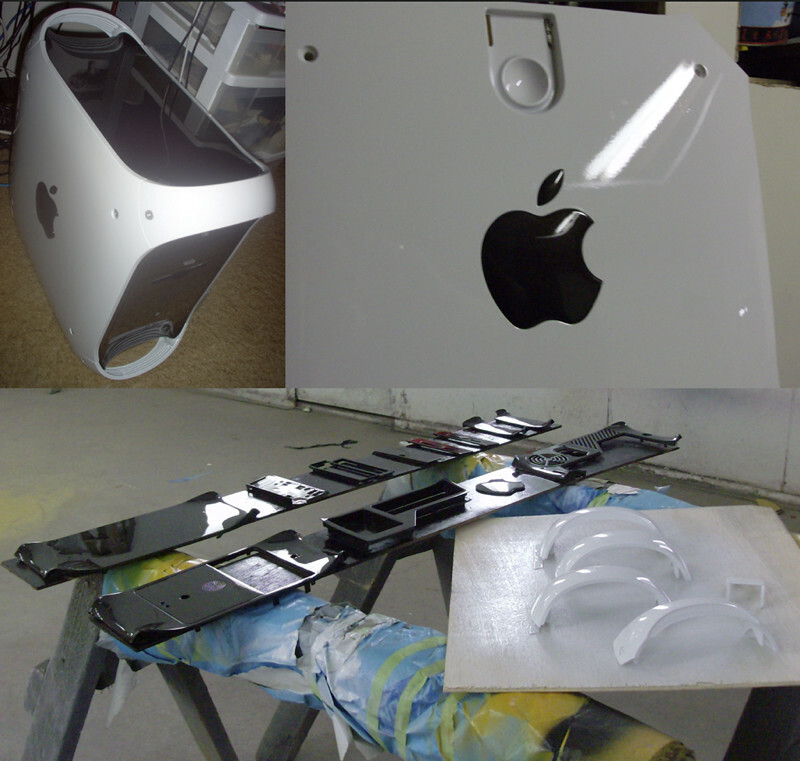 PowerMac G4/G5 as a file server? Discussion in 'PowerPC Macs' started by njaremka, Aug 24, 2011.
i have a 2010 MacBook Pro running 10.7 lion. will an older powermac g4/g5 running 10.5 work as a file server for my home network? It will easily work. I have a PowerMac G4/450 acting as one of my file servers on my home network (Files are provided to all my OS X Macs from my 2010 Mac Pro running Lion down to my PowerMac G3 running 10.3, and they all work fine). I would just get the cheapest G4 you can and fill it with drives. They make nice servers. If your going to run Leopard I would get a MDD G4, as they hold 4 drives as standard, and support any IDE drives you can find (Older Macs only support drives up to 128GB - I believe all Graphite Models and some Quicksilvers have this limitation). cool, thanks. i just want something i can store pictures, music, and movies without cluttering my MBP. if i can load enough hard drive space into it, i might even consider it for time machine backups. I run a total of 5 TB in my MDD including a 4TB RAID0, so you will be catered nicely. My G4 (see signature) is like a super file server and also handles my torrents and many other functions or things I really need to run 24/7 because I sleep my MacBook when it's not in use. It's even my gaming machine because I still play a lot of PowerPC games from the 1998-2005 era. Intel or PowerPC CPU is totally irrelevant when it comes to file sharing. A G4 tower and SATA PCI card together are a much better option than a G5. Even a G3 has all the CPU power you need to serve files. A G5 tower will use up to 3x the power a G4 does. for that matter, i could go with a first gen mac mini, too, right? then i could get an external firewire raid set-up for it. thoughts on that? as for specs, as long as whatever i get has an ethernet connection, and sata hard drive connections, i should be fine, right? processor speed and ram won't matter too much, will they? Files need longevity and therefore a file server should be on reliable hardware. The G4 mini's although newer than all the G4 towers won't have near the longevity of a G4 tower. I have seen several G4 mini's die over the last 2-3 years. With a tower you also don't have to spend extra on HD enclosures. You can get bare 2TB drives now for 60-70. A file server is just a dumb box so CPU speed is almost irrelevant. The slowest/cheapest G4 AGP tower you can find would be plenty CPU power. Just combine that with GB ethernet which all but 1 of the AGP towers have already and a SATA card. good point. i guess the added size of the tower outweighs the added complexity of a mac mini setup. what about the rest of the specs? should i just look for a tower that has sata hard drive connections and an ethernet port? No G4 tower has SATA unless you happen to buy one that someone has already added a PCI SATA card to. So you need a G4 tower + SATA PCI card. Those cards can be as low as 70 and as high as 200+. You would be fine with the $70 card. The FirmTek 1S2 is the cheaper one and the same one I use in my G4. You can also get a 4 drive model for another 40 or so I think. Both will work in any G4 tower. There are actually easy ways to fit up to 7 HD's in the pre-MDD towers. An MDD can only reach 6 max. and has the least reliable PSU of them all. You don't even need the extra performance you're paying for. The Sawtooth is the most reliable model by far but lacks GB ethernet. The advantage though is you can get a Sawtooth for 30-60 vs. 120+ for even the slowest MDD and then buy a $12-15 PCI GB ethernet card. These have 3 PCI slots so you would still have a free one to put a USB 2 or 3 card in it for extra expandability once you need more than 7 drives internally. You would need 2x of the 4 drive cards for 7 internal drives though. You could then use the 8th drive connector for external eSATA. End result is a G4 server capable of holding 14TB internally. To add to everything I have said so far you don't even need a screen for it. You can easily run a file server headless with built-in software right in OS 10.5+ to control the tower remotely. You don't even need a remote connection to just share files though. Only if you wanted to launch an app on the G4 or change a preference etc. excuse my ignorance, but what is "MDD" stand for? and which models are "Sawtooth"? lol, thanks, that helped a ton. Here is a thread I started a while back on exactly what GB ethernet PCI card will work in Macs with built in drivers already in 10.5.2+. GB ethernet file sharing makes remote drives perform like local ones. It's great. Even if you end up getting one with built in GB it's great to have 2 ethernet ports on a file server because then you can also you it as a firewall among endless other possibilities. Sorry no but I do have larger individual pics of the 3 in the collage I made for my sig. If you have anymore questions though please message me or whatever so we don't take over this thread. My personal home server is a 1998 400MHz PowerMac G4. I found it on craigslist for $30. I upgraded the SDRAM to 1GB (I had the sticks laying around), then put in a new GFX Card, and added a 2-port SATAII Controller. I have a 80GB IDE 7200rpm boot drive, 40GB IDE 5400rpm backup (to backup boot drive), and a 1.5TB Caviar Green HD for media/data. It's a pretty great FTP server. 1998 G4? The first G4 wasn't till late 1999. My bad. My year might be/probably is wrong. I wasn't into the Macintosh platform at that time period. If it's a Sawtooth like your signature says then it would have been built around Dec. 1999 - Mar. 2000. (Older Macs only support drives up to 128GB - I believe all Graphite Models and some Quicksilvers have this limitation). This is true but is a mobo limitation. If you're using SATA drives you're fine, as any PCI card you get will be able to handle standard sized drives (can't confirm above 1TB as I've never bothered, my G4 is now decomissioned/saved for the rare OS9 needs, but I know the PCI card in my G5 handles large drives both through SATA and eSATA). The noise coming off of G4s is also something to keep in mind. I had temporarily turned my Sawtooth into a server but couldn't stand hearing the drives constantly accessing and the fans 24/7 so back to OS 9 game machine it went. Sorry but any true geek loves the sounds computers make. It's all part of the experience. Any pre-MDD G4 tower is whisper quiet compared to an MDD. Also, how in the world is Apple or their G4 tower at fault for how loud the HD is? They don't make the drive..
Why not put it in another room if the noise bothers you that much. All a file server needs is an ethernet cable and space for it to sit. It certainly doesn't need a monitor or to be in the same room as your main computer. I'd love to get my hands on a G4 tower to do exactly what you guys are doing. Never owned one before, it's about time.